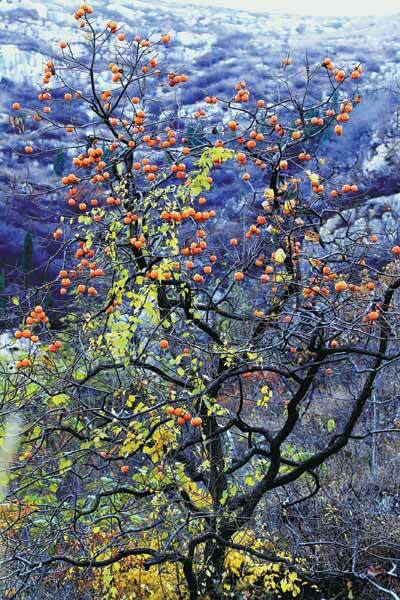 Persimmon trees are planted everywhere in the hundreds of valleys in the southern area of Qingzhou. In the mountains of Shandong province, Ju Chuanjiang and Zhao Ruixue discover settlements rich in color and blessed by nature. Autumn seems reluctant to leave the villages in the southern mountainous area of Qingzhou in Shandong province. Although it is already early into the coldest season of the year, these hamlets nestled into the hilly slopes are still wearing their fall colors of rich red, yellow and green, thanks to the smoke and phoenix trees and the pines that surround them. 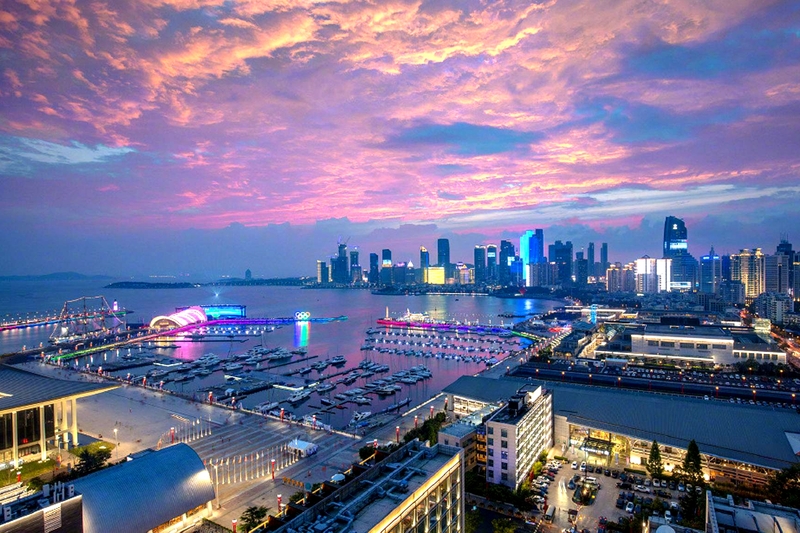 But there is one color that stands out, dotting the landscape like jewels - orange. In this region, the villages are famous for their quiet, undisturbed lifestyles, and their persimmons. Even though the peak has long passed, we managed to catch the last brilliance of the autumn harvest. Narrow tracks to the villages are the only approach and the roads become more and more precipitous the higher we climb. Our 30-year-old driver, with seven years of driving under his belt, is giving the roads his full concentration. "I dare not look down," he says. 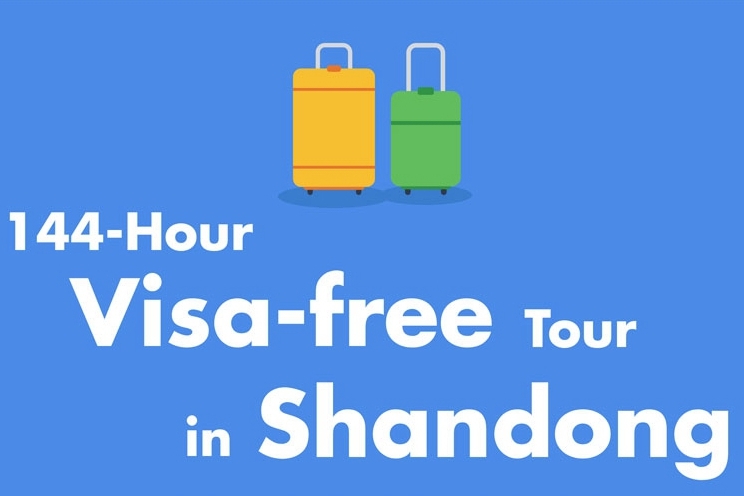 Half an hour later, we reach Shangshao village in Wangfen town, and the scenery changes from beautiful to breathtaking. There are rolling mountains in the distance and a sea of clouds hovering over the trees. Here, century-old persimmon trees are as tall as 6 meters. The leaves have all fallen, leaving just the red gold fruits attached to gnarled branches. Zhang Yunwu, a resident at the village, was busy harvesting the last persimmons. "The 50 odd persimmon trees I planted can produce around 5,000 kilograms of persimmons each year," Zhang says proudly. "The dried persimmons are exported to other countries," he adds with a big smile. According to Zhang, persimmon trees are planted everywhere in the hundreds of valleys in the southern area of Qingzhou, making it a famous persimmon production base in Shandong. "We have been planting persimmon trees for generations. Persimmons produced here have been selected as gifts to the courts since the Tang Dynasty (AD 618-907)," Zhang says. In early winter, harvested persimmons have already been strung together and hung up in front of almost every house, creating a spread of color. It's not such an easy process as just stringing them up. Farmers have to climb up the tall trees on creaky ladders to collect the fruit. Before stringing the persimmons up, they have to be carefully peeled. To make quality persimmon cakes, as the dried fruits are called, Zhang says he has to massage them regularly. 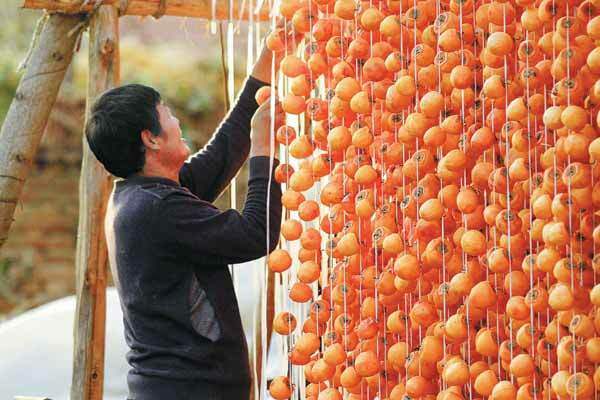 "A week after you first string them up, you have to gently massage each persimmon every other day," Zhang says. A light touch massage works better than a deep, he says. After a few weeks of rubbing, the fructose in the persimmons rises to the surface, making it appear as if each fruit has been dipped in powdered sugar. The fruits are done when they are properly dehydrated and have a chewy texture. Qingzhou produces more than 30,000 tons of persimmons and the dried fruit is sold to dozens of countries, including Japan, the Republic of Korea and the United States.